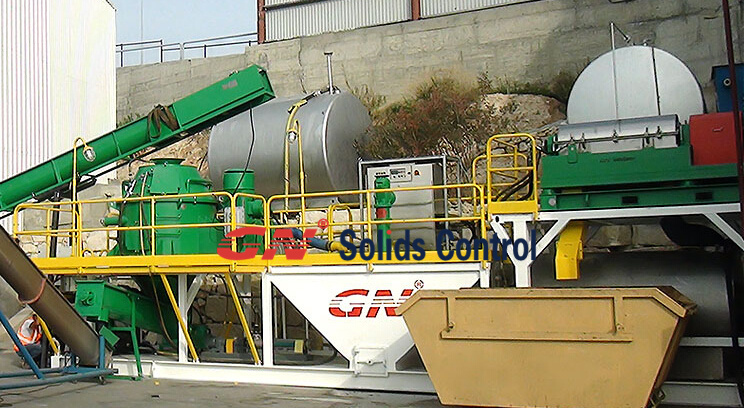 At present, more and more customers have noticed the considerable prospects of domestic oil sands disposal projects, and drill cuttings dryers are one of the most common separation methods among oil sands separation methods. However, what is the economic benefit of the use of rock chip dryers in the recovery of waste oil-based drilling fluids? Generally, the oil content of drill cuttings with oil-based drilling fluid is 20%, and the oil content of drill cuttings after spinning treatment is about 10%. Dryer processing capacity of about 10t / h, 25 tons of debris can be recovered 1 tons of impurities in oil (cuttings density of 2.5t / m3). 0.4 tons of oil after purification. Each ton of oil can make a profit of 15,000 yuan (CNY), 0.4tx1.5 yuan/t=0.6 yuan (CNY). There are 7 persons required to build the factory in a centralized manner. The annual cost of personnel is about 1 million (CNY) (the estimated annual income of employees), and the cost per person per day is about 397 yuan. 7 people cost 2778 yuan per day (CNY). 5、Equipment electricity fee: According to the dryer, processing 10 tons of oil-based drill cuttings per hour, and producing 1 ton of oil requires 2.5 hours of electricity and the cost is 40×2×2.5×1≈200 yuan. Vehicle use fee: RMB 1200 for each 30 tons of vehicles, RMB 400 for each ton, and RMB 25×400 for each ton of oil produced. 9, other costs of about 200 yuan (CNY), (environmental protection, fire, out, foreign employment, etc.). Two dryers can produce 6.4 tons of oil products every day for 8 hours. The income is RMB 38,400 and the profit is RMB 3224.8 (CNY). Supply double deck adjustable shale shakers?